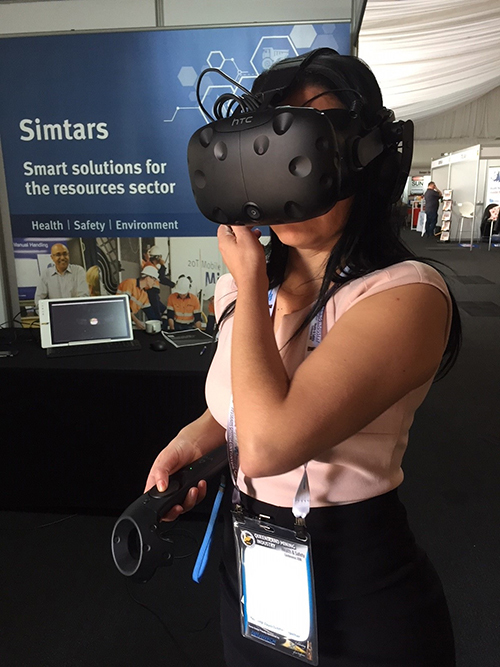 Simtars was delighted to showcase the work they are doing in developing their virtual reality training packages at the 2018 Queensland Mining Industry Health and Safety Conference. Conference attendees experienced first-hand the collaborative work that Simtars is doing with Immersive Technologies and Downer to develop training solutions—including virtual reality goggles for users to go underground and walk through the Downer-operated Meandu mine site, coal handling and preparation plant. Utilising new and developing technology is a key approach to raising the standard of health and safety training. Working in partnership with industry to do this is of paramount importance. Conference attendee Claudina Costelloe immerses herself in the VR experience.